Maybe I’m just becoming a pernickety old man, but I find myself more and more easily irritated by people who think they know something they don’t. The latest example is this “Street Art” hoarding in Gothenburg. It’s more irritating because it’s actually quite a good idea that is spoiled by the artist’s ignorance. 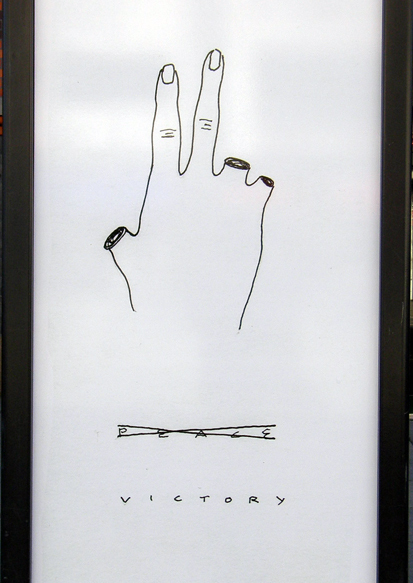 The ‘V’ sign can mean both victory and peace and the artist has thought to contrast these two senses, as you can see, by showing this mutilated hand. Under almost any other circumstances, I’d applaud this. It’s a clever idea. 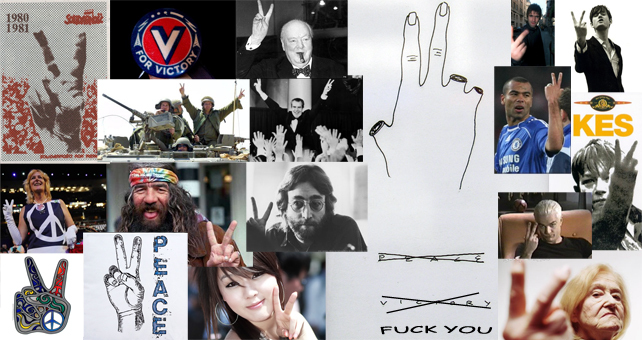 The ‘V’ sign, whether meaning victory or peace, is made with the palm of the hand facing towards the viewer. When it’s made with the back of the hand towards the viewer it has another meaning. See below!